Christmas isn’t over yet! Keep the festivities going for 12 days and celebrate Epiphany with your Children! Christmas is over, time to take down the decorations…wait, Stop! No it isn’t! Contrary to the popular belief that Christmas is one day and come December 26th, Christmas is over, the reality is that Christmas is a season – the season that continues on for 12 days until January 6th, or Epiphany! Epiphany is celebration of when the three wise men finally reach Jesus in the manger and gift him with Gold, Frankincense, and Myrrh. Depending on your faith, culture, and where you live – you might even celebrate Three Kings Day with gift giving to family. Our Big celebration of Christmas happens ON Christmas Day, but it isn’t a one day event, I think of it more like a kick-off. We keep all the decorations up, Christmas music still plays, and you might find a ginger bread house or two being made in the coming weeks. There are some wonderful ways that families celebrate the Christmas season together but taking the focus off of the ONE day and spreading things out throughout the twelve days. Do a special Christmas activity together each day. Gather the children on Christmas night and explain to them that Christmas is just beginning and the wise men are searching for Jesus. Encourage the children to also search for Jesus, in each other. On epiphany morning, each child can give their siblings a gift that shows how they found Jesus in that person. Have a 12th night dinner with your family. Gift your family with three gifts of Gold (a family gift/activity), Frankincense (a Religious item), and Myrrh (gifts for the body) on Epiphany. Read the book “A Star from a Far” and have the Wise Men travel to the manger of your Nativity, moving a little closer each day. Wrap 12 Christmas books in gold paper, open on each day and read it together. Do an Epiphany Blessing for your Home. If you weren’t able to celebrate Christmas Day with the whole family, plan an Epiphany Celebration for the rest of the relatives. When Epiphany Day comes, in many cultures this is a huge day of celebration, complete with gift giving and family parties with King Cake! Instead of Santa coming on Christmas Eve, they might have the “Wise Men” deliver gifts on Epiphany! 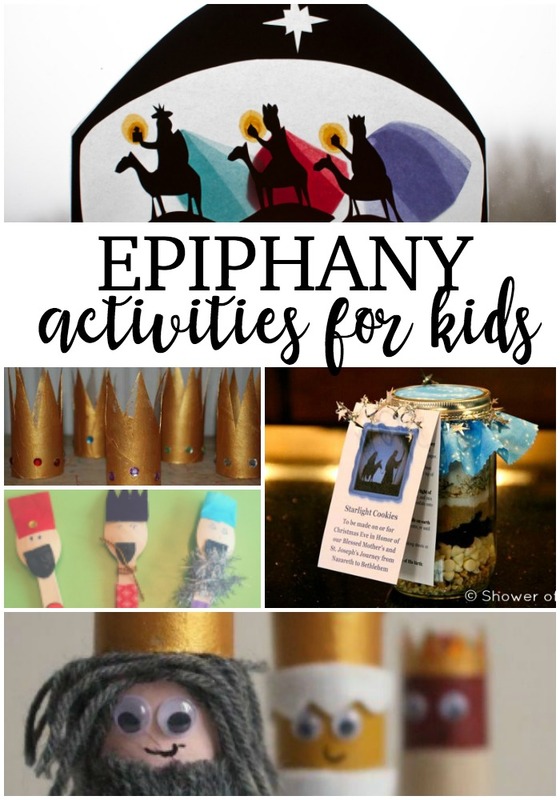 A wonderful way to celebrate the 12 days of Christmas and Epiphany is by making Epiphany Crafts! Make Three Kings Puppets to retell the story of Epiphany, or dress up as the Three Kings and put on an Epiphany Play. The little ones will enjoy crafting their own card board tube Kings or popsicle stick Kings. Decorate your windows with beautiful Stained Glass Stars and Nativity Scenes. Play an Epiphany game with the kids. And of course, Kings Crowns! I love these cardboard tube kings crowns, perfect for decorating with or you could make a wearable version of a kings crown for the kids to wear. Does your family celebrate the twelve days of Christmas and Epiphany? I’d love to hear all about your traditions!